Akamina Parkway, and ends back at the Waterton Park Townsite at Cameron Falls. 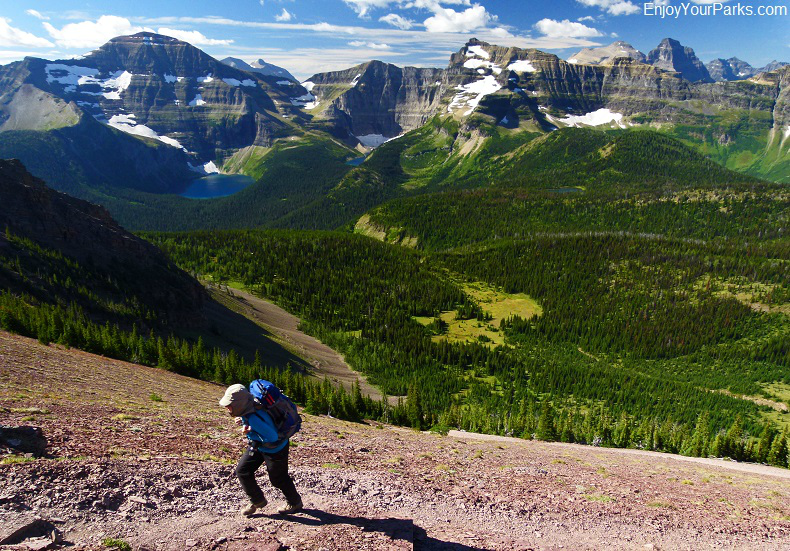 You will not only hike by four gorgeous lakes (actually 5 if you count Cameron Lake), but you will also enjoy absolutely spectacular views of Glacier National Park Montana to the south as the trail works its way up to Carthew Summit. 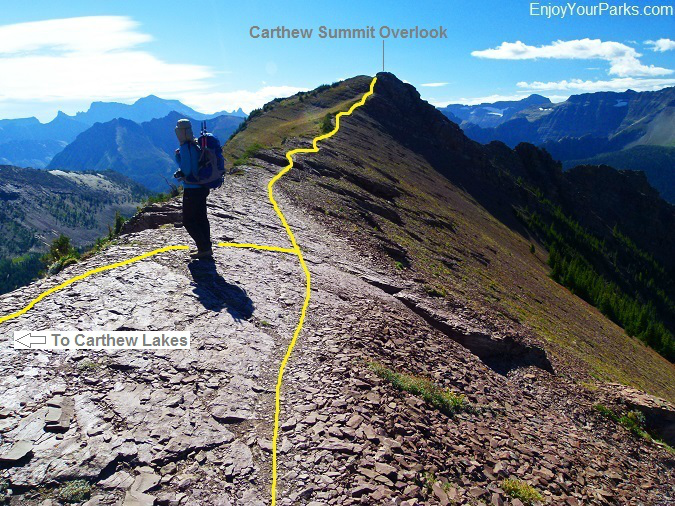 At Carthew Summit, you have the option of hiking about a half mile to the Carthew Summit Overlook, which really gives you a front row seat to an amazing view of the Northern Wilderness of Glacier National Park, or you can choose to hike up to the actual summit of Mount Carthew, which is the third highest peak in Waterton Lakes National Park at 8,589 feet above sea level. Or of course you can do both! 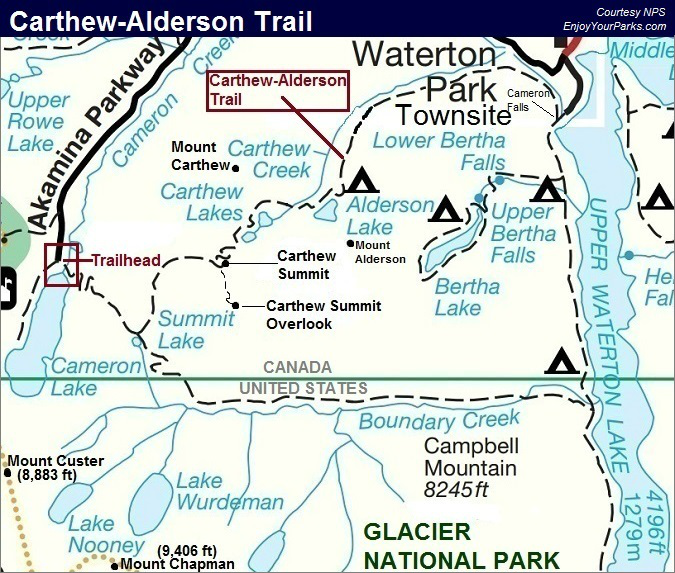 From Carthew Summit, the main Carthew-Alderson Trail continues downward and eastward to the Carthew Lakes, then Alderson Lake, and finally ends up at Waterton Townsite right in front of Cameron Falls. The shuttle leaves fairly early in the morning so you will have plenty of time to not only enjoy the Carthew-Alderson Trail, but you will also have plenty of time to hike to the summit of Mount Carthew and/or the Carthew Summit Overlook. We've done both of these "extras" and still made to down to Waterton Park Townsite in ample time before dark. This convenient shuttle takes you to the end of the Akamina Parkway, and drops you off at Cameron Lake, which is where your Carthew-Alderson Trail adventure begins. 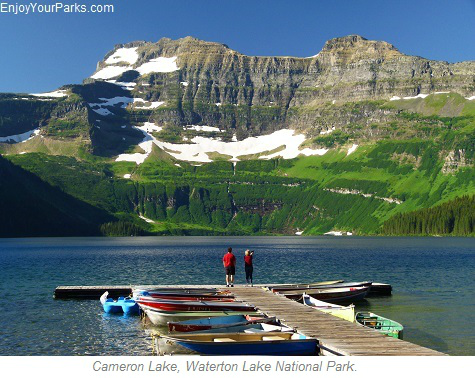 No one in their right mind would hike from Waterton Townsite to Cameron Lake unless of course they're doing this for training (cardio) purposes. 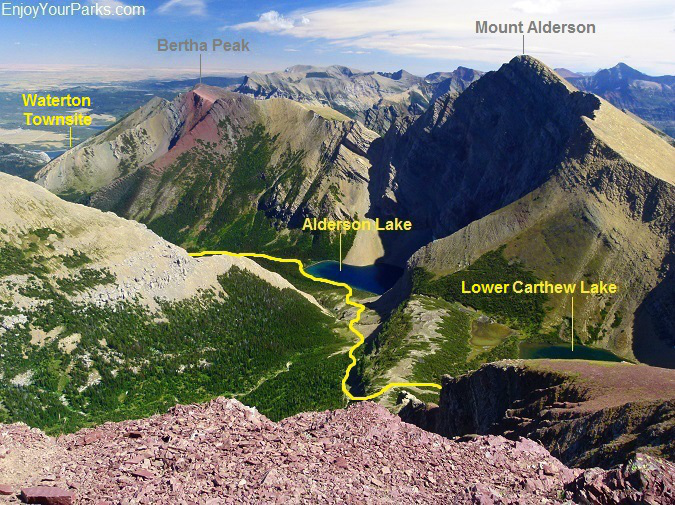 If you start at Cameron Lake, you only gain 1,438 vertical feet to get to the highest point along the Carthew-Alderson Trail in Waterton Lakes National Park at Carthew Summit (7,720 feet). You then LOSE 3,142 vertical feet as the trail drops down to Waterton Townsite, which is 7.5 miles east of Carthew Summit. If you want to gain 3,142 vertical feet instead of 1,438 vertical feet, be our guest. Again, if you want to avoid a lot of vertical elevation gain, start at Cameron Lake like 99% of the hikers do on the Carthew-Alderson Trail. Once you're dropped off at Cameron Lake at the end of the Akamina Parkway in Waterton Lakes National Park, from the boat dock simply take the wide obvious trail that heads to the east (left). 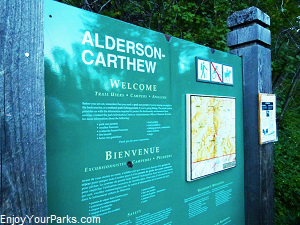 After crossing the outlet stream of Cameron Lake on a well-built foot bridge, you will encounter the Carthew-Alderson trailhead sign. The trail then climbs fairly abruptly through a series of switchbacks through a forested slope as the Carthew-Alderson Trail works its way up to Summit Lake that rests on a high bench to the east of Cameron Lake. As you climb in elevation, the view to the west gets more and more interesting. 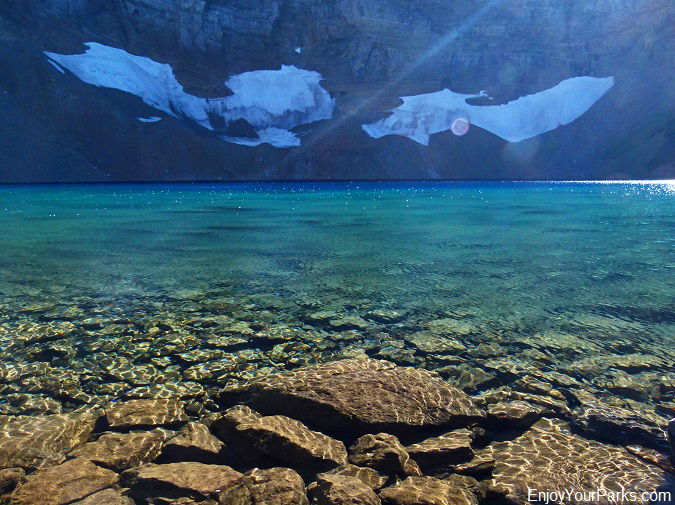 Summit Lake is a very scenic mountain lake that is surrounded by forest, and is blessed with an amazing backdrop of Glacier National Park's Mount Custer and Mount Chapman to the south. You will definitely be getting your camera out for a view shots of this beautiful lake. 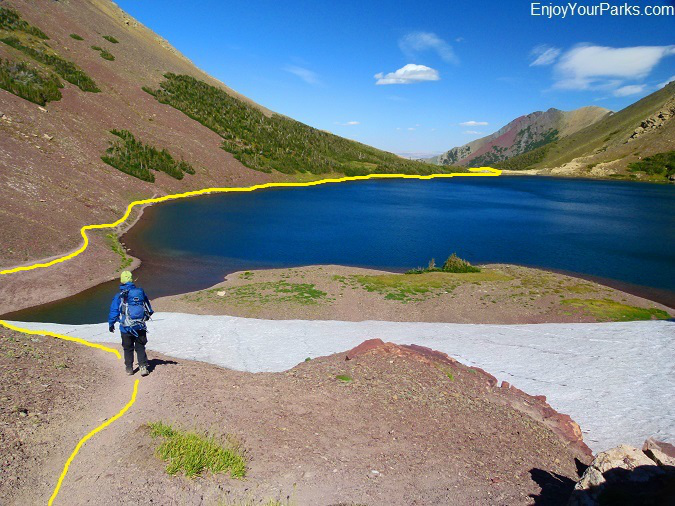 Also at Summit Lake, you will encounter the North Boundary Trail Junction. 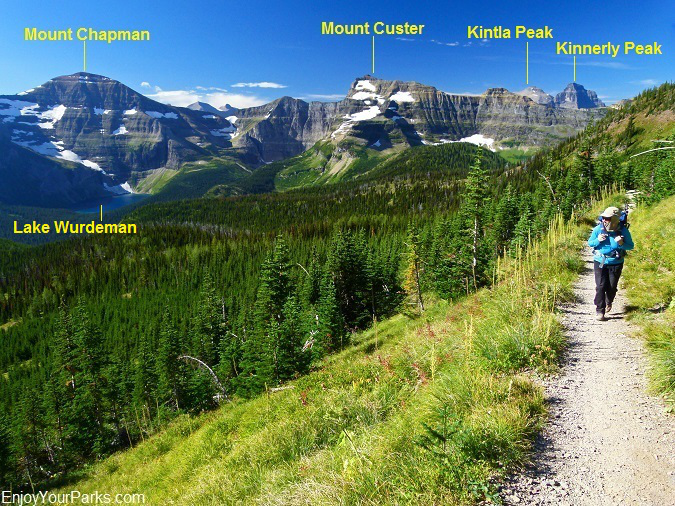 This trail works its way southward and crosses into Glacier National Park as it follows the deep, wide, and extremely vegetated valley just north of Mount Chapman. 8 miles from Summit Lake, this trail ends up very near the International Boundary on the U.S. side, just about a mile south of Boundary Bay Campground, which is part of Waterton Lakes National Park. 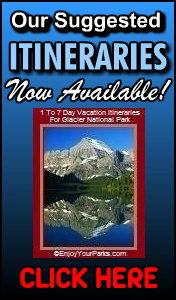 You will get a terrific view of the remote Northern Wilderness of Glacier National Park as you work your way along the Carthew-Alderson Trail beyond Summit Lake. View of Mount Chapman and Mount Custer of Glacier National Park from the Carthew-Alderson Trail in Waterton Lakes National Park. The lake below the north face of Mount Chapman is Lake Wurdeman. As the trail leaves Summit Lake, it gradually begins working up the large south slope which represents the long west buttress of Mount Carthew. This is an extremely scenic section of the Carthew-Alderson Trail, so take your time and enjoy the beauty! 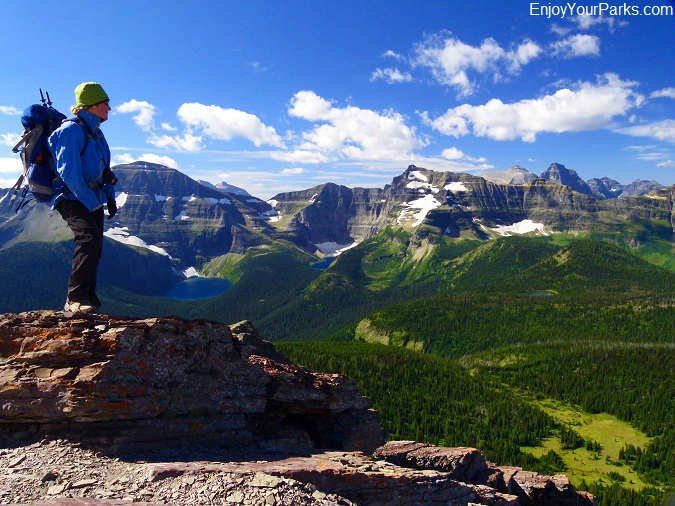 As you gain in elevation, you will enjoy a spectacular view of the remote Northern Wilderness of Glacier National Park to the south, including the giant Kintla Peak, Kinnerly Peak, Mount Custer and Mount Chapman. And the more you gain in elevation, the more dramatic the view becomes.... it just keeps getting better and better! 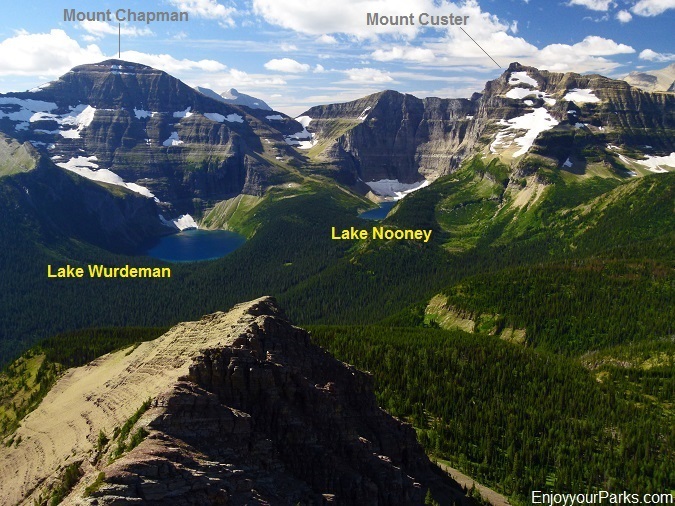 The northern mountains of Glacier Park completely dominate the view to the south, and you also can't help but notice the azure-colored Lake Wurdeman that rests below the ominous north face of Mount Chapman. You are getting a front row view of some incredibly remote country that very few humans ever venture into. 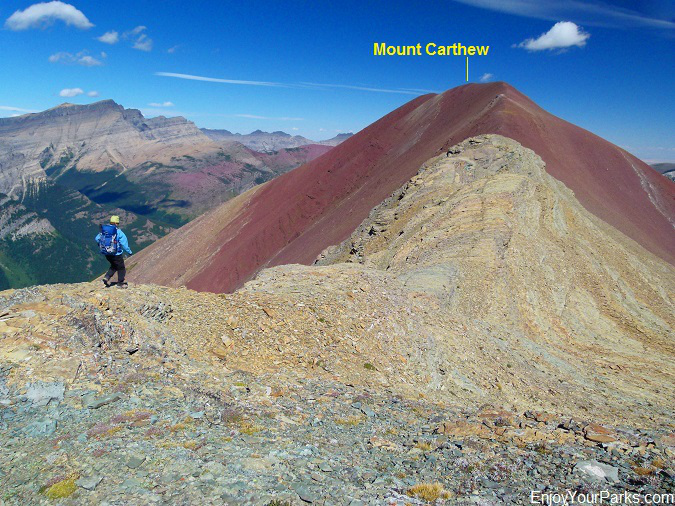 The Carthew Summit is the highest point along the Carthew-Alderson Trail in Waterton Lakes National Park. At this spot, you can take the easy half mile spur trail to the Carthew Summit Overlook to the south. This is a view of the Carthew Summit Area from the Carthew Summit Overlook. Note the climber's trail that takes you to the summit of Mount Alderson. 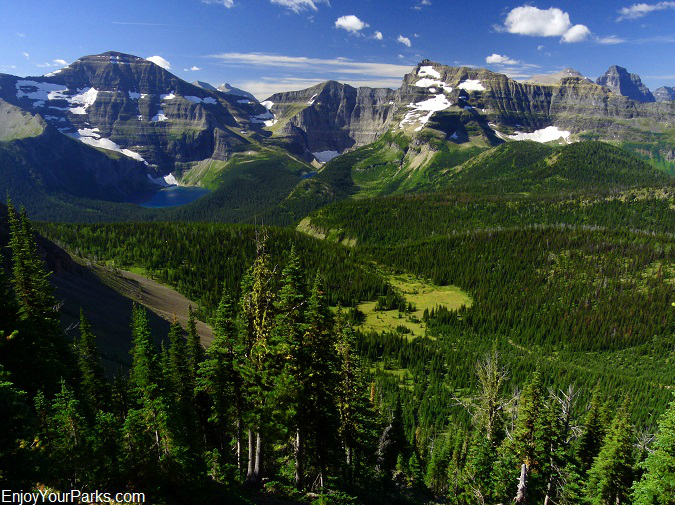 The Carthew Summit Overlook provides an outstanding view of the remote Northern Wilderness of Glacier Park to the south, including Kintla Peak, Kinnerly Peak, Mount Custer and Mount Chapman. The view from the Carthew Summit Overlook of some of the mountains in the remote Northern Wilderness of Glacier National Park Montana is breathtaking and fascinating. 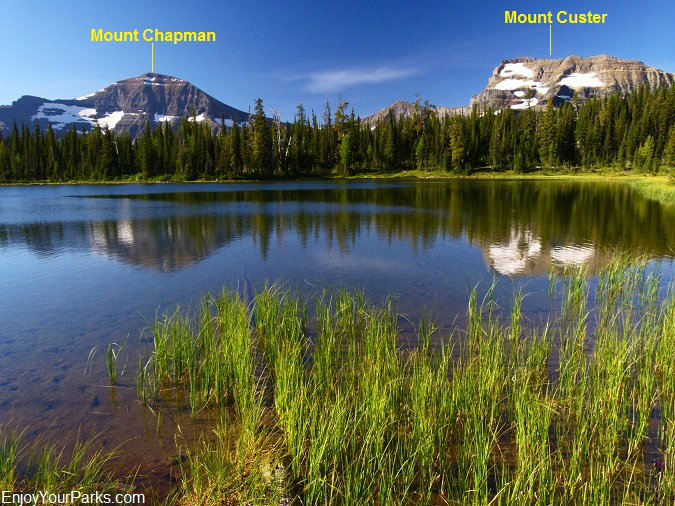 Note the glacial lakes below Mount Chapman and Mount Custer. The Carthew Summit Overlook is only about a half mile south along the ridge, and is easily found by a well-used foot trail. The view of Glacier National Park from the overlook is astounding, as well as every other direction. You will also get a great view of Mount Carthew to the north, and towering Mount Alderson to the east. If you're not in a hurry, we highly recommend that you take this short spur trail to the Carthew Summit Overlook. It's definitely worth the time and effort. Shannon on the west ridge of Mount Carthew, heading for the summit. 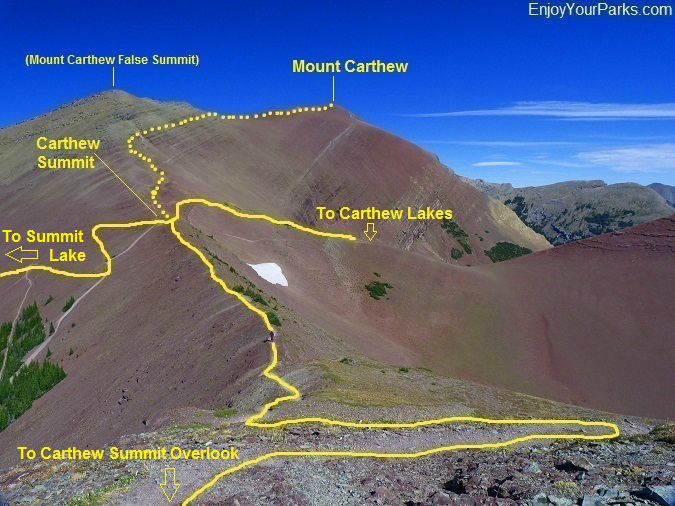 There is an obvious "climber's trail" that heads north from Carthew Summit that takes you up to the summit of Mount Carthew. This is definitely going to require that you be in fairly good physical condition because you're gaining about 900 vertical feet in less than a mile, and the trail is primitive. The false summit is directly above Carthew Summit to the north, and the true summit of Mount Carthew is farther to the east along the same ridge. Both summits provide excellent views in all directions, and there is no "mountain climbing" involved. You won't have to use your hands the entire way, therefore this not considered a scramble. 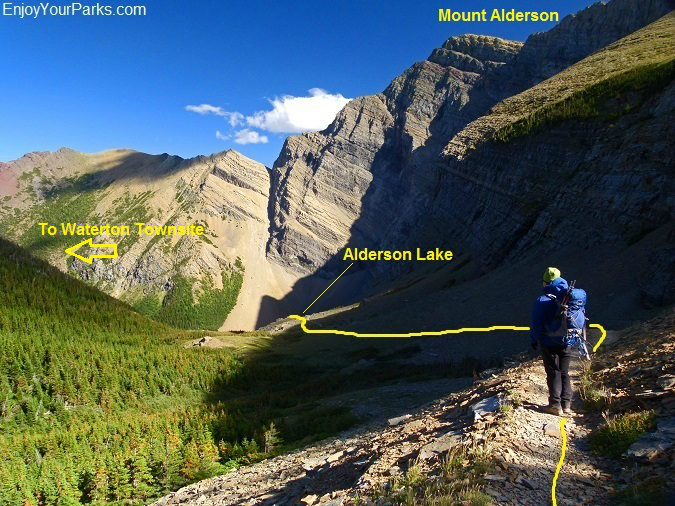 So if you want to bag the third highest peak in Waterton Lakes National Park, here's your chance! View of the Carthew Lakes from the west ridge of Mount Carthew in Waterton Lakes National Park. 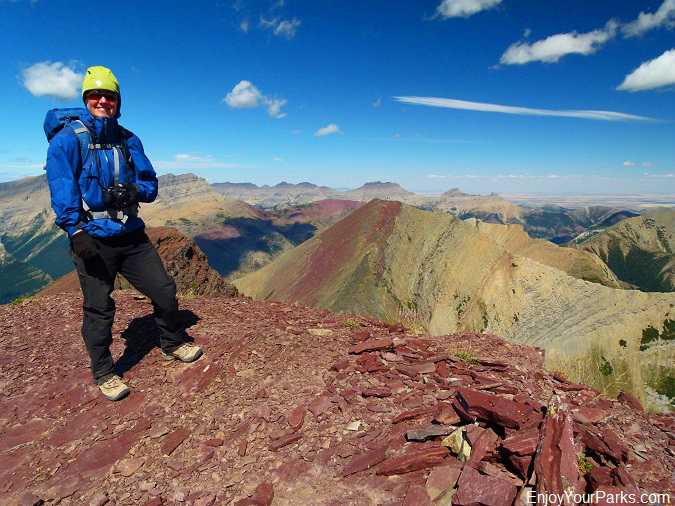 Shannon standing on the summit of Mount Carthew, the third tallest peak in Waterton Lakes National Park. The camera is facing northeast. 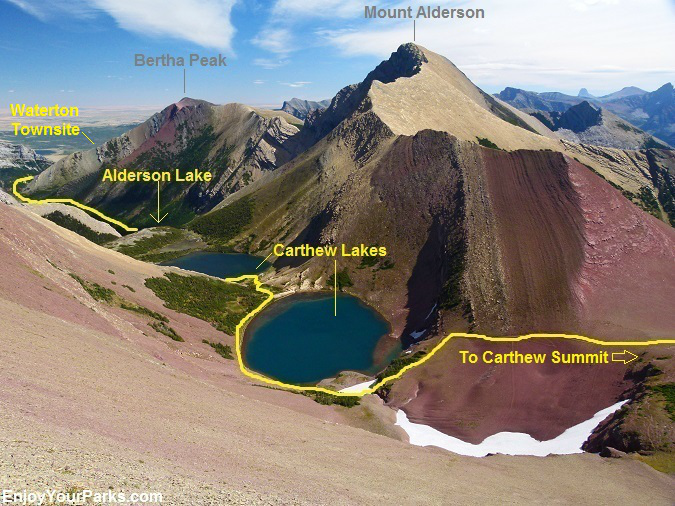 From Carthew Summit, the main Carthew-Alderson Trail in Waterton Lakes National Park works its way eastward down to Upper Carthew Lakes. Mount Alderson dominates the skyline above Upper Carthew Lake to the south. The scenery is fantastic the entire way down to Upper Carthew Lake and beyond. Once you reach the Upper Carthew Lake, the Carthew-Alderson Trail works its way around the north shore of the lake as it heads further to the east towards Lower Carthew Lake. For some reason, Upper Carthew Lakes always seems to be where we stop and enjoy lunch. It's out of the wind for the most part, and it's a very scenic place to take in the view while consuming some calories. Plus it's really the first place to fill our Nalgenes (using a water filter) since we left Summit Lake... plus we usually hike up to the summit of Mount Carthew and also visit the Carthew Summit Overlook while we're on the Carthew Summit ridge... so we're ready for some food and water by then. Upper Carthew Lake along the Carthew-Alderson Trail in Waterton Lakes National Park. 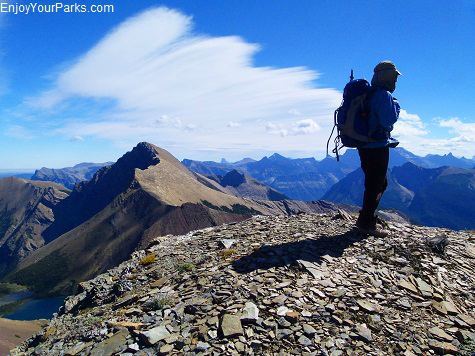 Once the trail leaves Upper Carthew Lake in Waterton Lakes National Park and heads east over rocky terrain that is sparsely forested and very enjoyable, you will drop down in elevation a few hundred vertical feet to Lower Carthew Lake. The view is again wonderful along this portion of the trail and it wraps around the north shore of Lower Carthew Lake. The Carthew Alderson Trail then begins to drop even more in elevation as you enter a narrow valley with Mount Carthew to the northeast and Mount Alderson to the south. You will see glimpses of Alderson Lake at the base of the gigantic east wall of Mount Alderson as you follow the trail downward. Lower Carthew Lake along the Carthew-Alderson Trail in Waterton Lakes National Park. Beyond Lower Carthew Lake, the trail begins to head down a narrow valley towards Alderson Lake. A view of Alderson Lake from the summit of Mount Carthew in Waterton Lakes National Park. 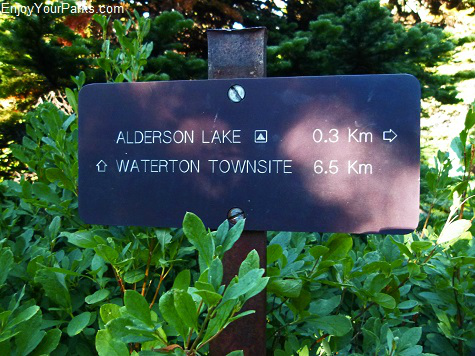 and it takes you to the east shore of Alderson Lake, as well as the Alderson Lake Campground. The enormous east face of Mount Alderson towers over Alderson Lake to the west, and is so high and so close that you can't even get a full photo of it. Alderson Lake and its surroundings are very scenic, and we always enjoy visiting this gorgeous mountain lake nestled below towering cliffs. Once you've spent some time enjoying Alderson Lake and you hike 0.2 miles back to the main Carthew-Alderson Trail, you are now on the final stretch. Alderson Lake along the Carthew-Alderson Trail in Waterton Lakes National Park. those who want to spend the night along the Carthew-Alderson Trail. 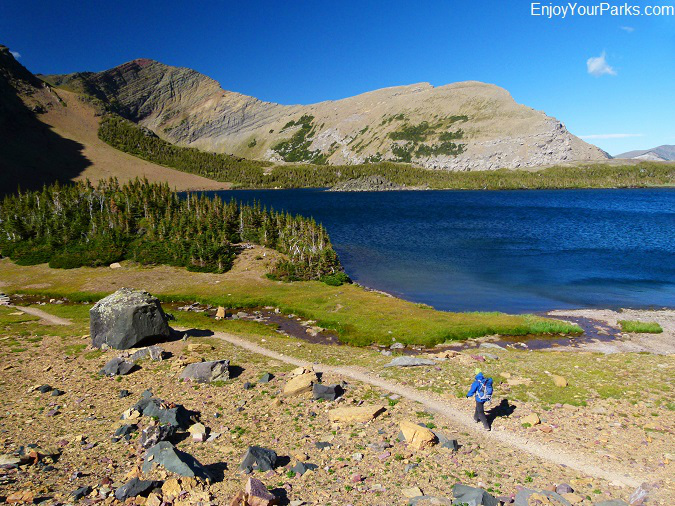 Now personally, we'd rather enjoy this trail as a day hike instead of having an overnight pack on our backs. But we've also learned through the years that "to each his own", and if someone wants to spend the night along the shore of this gorgeous lake, underneath the towering east face of Mount Alderson, then that's great. 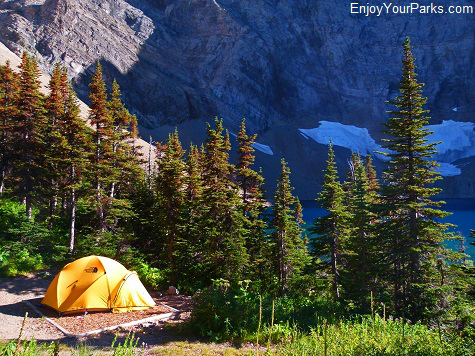 Whenever we see a tent here, we wonder if they hiked up from the Waterton Townsite, or hiked from Cameron Lake. directly above you is Bertha Peak, which you will not be able to see from the trail. Cameron Falls is about 1,600 vertical feet lower than Alderson Lake, and over 3,100 vertical feet lower than the highest point along the Carthew Alderson Trail at Carthew Summit. 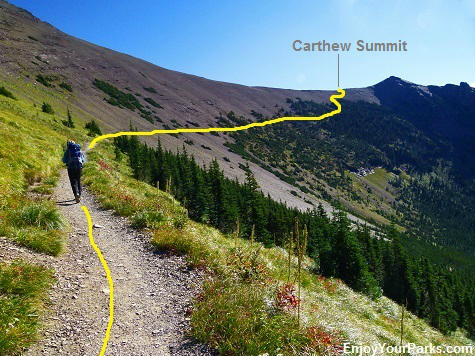 The entire way down from Carthew Summit you'll be thankful you're hiking DOWNHILL instead of UPHILL! Cameron Falls is the perfect end to an absolutely wonderful day hiking the fantastic Carthew-Alderson Trail in Waterton Lakes National Park. 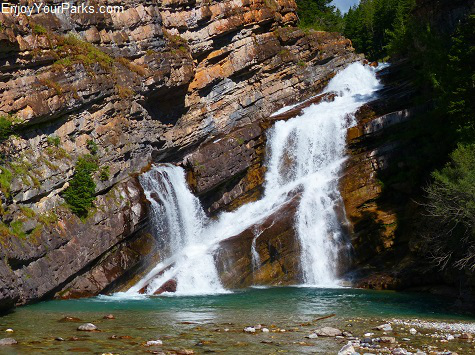 This popular trail is one of the most popular longer day hikes in Waterton Lakes National Park, and is also one of our favorite hikes in the park. 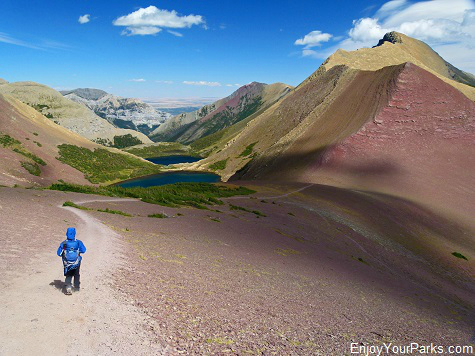 The scenery is gorgeous the entire way, and there is so much variety along this amazing trail that you'll be extremely glad you spent the day enjoying this beautiful area in Waterton Lakes National Park.